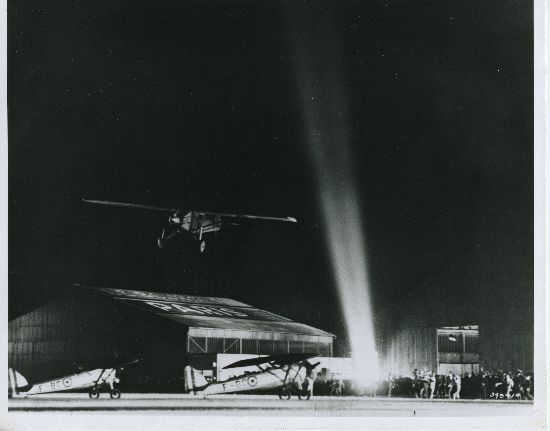 After a flight of 33 hours, 30 minutes, 30 seconds, from Roosevelt Field, Long Island, New York,United States of America, Charles A. Lindbergh lands his Spirit of St. Louis at Le Bourget Aerodrome, Paris, France, at 10:22 p.m. (20:22 G.M.T. ), 21 May 1927. He is the first pilot to fly solo, non-stop, across the Atlantic Ocean. “I circle. Yes, it’s definitely an airport. . . It must be Le Bourget. . . I shift fuel valves to the center wing-tank, sweep my flashlight over the instrument board in a final check, fasten my safety belt, and nose the Spirit of St. Louis down into a gradually descending spiral. . .
“I straighten out my wings and let the throttled engine drag me on beyond the leeward border. Now the steep bank into the wind, and the dive toward the ground. But how strange it is, this descent. I’m wide awake, but the feel of my plane has not returned. . . My movements are mechanical, uncoordinated, as though I were coming down at the end of my first solo. . .
— The Spirit of St. Louis, by Charles A. Lindbergh, Charles Scribner’s Sons, 1953, Pages 489–492. 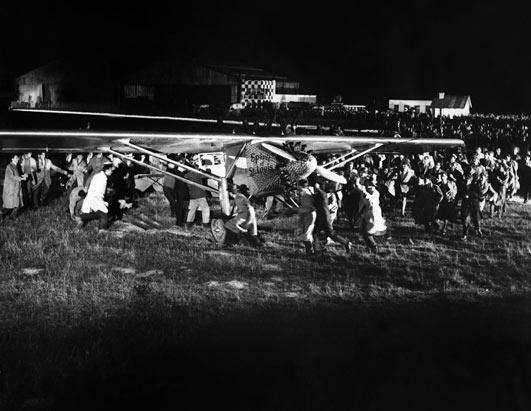 Over 100,000 people have come to Le Bourget to greet Lindbergh. He has flown the Spirit of St. Louis into history. A great day in aviation history for sure. BTW, the photos showing Lindbergh at Le Bourget are actually stills taken during the filming of the Jimmy Stewart movie “The Spirit of St. Louis” first released in 1957. Thank you, Ty, I had wondered about that myself, but nothing in the notes accompanying the photos from the San Diego Air and Space Museum Archives suggests that they are anything but authentic.